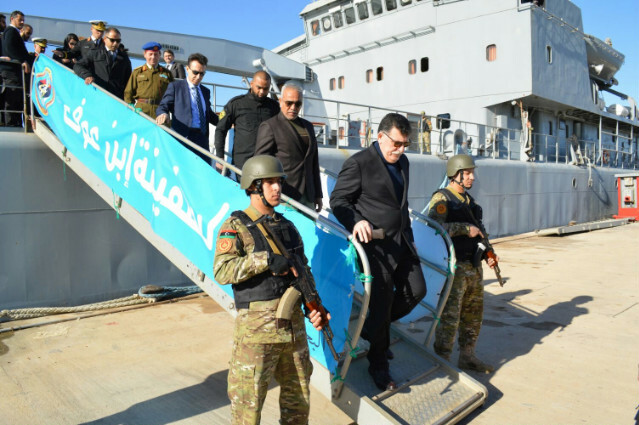 Serraj visits Libyan naval ship Ibn Ouf after it was repaired by the Italian Navy (Photo: GNA). Presidency Council head Faiez Serraj visited Libyan naval ship Ibn Ouf at Tripoli’s naval base, Abu Sitta, Thursday with Italian ambassador Giuseppe Perrone, to mark the end of maintenance of the ship by Italy. The Libyan naval ship has been operative for a while and is used in operations against illegal migration traffickers. The Libyan naval ship has been undergoing repairs in Abu Sitta since December 2017 by Italian Navy staff from the Italian naval ships Capri and Tremiti. This support is part of Italy’s technical support for the Libyan Navy and Coast Guard called Operation Nauras. The Italian Defence Ministry reported that Serraj thanked Italian ambassador Perrone for the important contribution that Italy and its Armed Forces, and specifically the Italian Navy, for the restoration of Libyan naval vessels. The cost of the maintenance of Ibn Ouf was paid for by Italy as part of the Memorandum of Understanding signed in Rome on 2 February 2017 by Faiez Serraj and Italian Prime Minister Paolo Gentiloni. The MoU was on cooperation in the fields of development, illegal immigration, human trafficking, smuggling and on strengthening border security between Libya and Italian. The MoU is part of the implementation of the Treaty of Friendship, Partnership and Cooperation, signed in Benghazi in 2008 by the former Italian prime minister Silvio Berlusconi and Muammar Qaddafi and the Declaration of Tripoli of 21 January 2012. The MOU states that Italy provides technical and technological support and, finance Libyan operations in the fight against illegal immigration, represented by the border guard and the Coast Guard of the Ministry of Defence of GNA, and by the competent bodies and departments at the Libya’s Interior Ministry. Italian Foreign Ministry sources also reported that in the context of Italy’s support for the rehabilitation of Libyan naval vessels, four Bigliani class patrol boats were assigned to the Libyan Coast Guard following completion of crew training in Italy in the second half of 2017. Six other patrol boats will also be returned to the Maritime Security Police of the Libyan Ministry of the Interior by the Italian Ministry of Interior at the conclusion of the next training cycles. The Italian commitment goes beyond the re-launching of the vehicles, and also covers assistance in the long-term maintenance of boats. The Italian Foreign Ministry source also confirmed to Libya Herald that Italy has been committed to cooperation with Libya since the beginning of the Libyan crisis in emergency initiatives and in development activities in areas such as health, education, food safety for the most vulnerable in the local population. Overall, 11 million euros were approved for Libya in 2017. Italy attaches great importance to the role of Libyan Municipalities in view of the fundamental role they play in ensuring essential services to the civilian population. For this reason and following numerous requests for assistance from Municipalities, the Italian Government is working with European institutions on a program to support the socio-economic development of Libyan Municipalities. A program worth 3 million euros for capacity building is also being prepared for Libyan municipalities. In August 2017 Italy delivered to the mayor of Zuwara 5,000 sanitary and first aid kits for migrants as well as the training of officers and non-commissioned officers of the Libyan Navy and Coast Guard in Rome. Recently, another 2 million euros was invested in rubbish disposal in the capital. In 2018 165.388,00 euros will be donated for Libyan infrastructural projects as part of the 2008 Friendship Treaty of Benghazi of 2008. Another 117.388,00 euros is set for 2019. On Friday, Italy revealed that a new Control Centre against transnational crime, human smuggling and terrorism was set in motion in Rome by Italy and Libya in presence of the Italian Interior Minister Marco Minniti. This Centre will result in enhanced judicial and police cooperation, strengthened rule of law, rights and guarantees, and increased information exchange. It will consist of representatives from the coastguard, the illegal migration department, the Libyan Attorney General and the intelligence services, along with their Italian counterparts. It is also reported in the Italian press that in 2018 Italy will deploy 375 soldiers to Libya, a hundred more than last year, at an expected cost of 34 million euros in the first nine months of the year. Italian Air Force technicians are also restoring Libyan C-130H cargo planes and a new contingent of army instructors and advisors will train the GNA army. The Italian efforts to stem illegal migratory flows, of which Libya is the first victim, will concentrate not only on the coast, but also in the south and neighbouring countries such as Niger, Mali and Somalia. According to data from the Italian Ministry of the Interior, counter measures against illegal migration crossing the Mediterranean from Libya have led to a 34 percent decrease of arrivals in 2017, compared to the previous year. Many NGOs, however, see this bilateral agreement as a “pushback” policy, a way to transfer the problem of illegal migration from Europe to Libya, rather than a permanent long-term solution.